Red Bull’s Mark Webber gave Australian sports fans something to talk about besides the cricket by shrugging off a drive-through penalty at the Nurburgring and cruising to his first-ever Formula One victory. A dramatic start to the German Grand Prix saw Webber side-swipe Brawn GP’s Rubens Barrichello as the pair battled for the lead, then moments later survive a surging attempt at a pass by the KERS-equipped Lewis Hamilton. The reigning world champion clipped Webber’s car as he passed it, suffering a puncture that forced him wide off the track. By the time he’d limped around to the pits for a new tyre he was a lap down and doomed to finish last. Barrichello, meanwhile, had taken the lead but could not build a safe margin over the faster Webber – although behind them Heikki Kovalainen in third place was backing up the rest of the field, taking the pressure off the leaders. Webber was ordered into the pits for a drive-through penalty for causing a collision with Barrichello, but before he took it the Brazilian pitted for the first of his planned three stops, meaning Webber retained the lead even after his penalty. And by the time he took his first real pitstop, emerging seventh behind several cars out of position on different strategies, Barrichello was bottled up behind Felipe Massa and unable to take advantage. The disadvantageous three-stop strategy, combined with a faulty fuel rig that delayed his second stop, led Barrichello to make a brutal post-race attack on his team for giving a master-class on how to throw a race away. 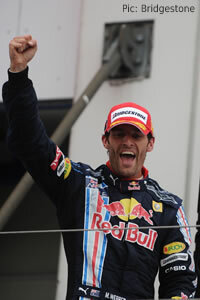 With Hamilton and Barrichello removed as threats, and Jenson Button held back by tyre management and his own three-stop strategy, there was nothing except the weather left to challenge Webber for the win – and when it stayed dry he duly wrapped up his maiden victory, shouting and howling with joy as he crossed the line. Team-mate Sebastian Vettel had a quiet day in coming home third from Massa, the Williams of Nico Rosberg took fourth, and the Brawns survived some very ragged rear tyres to successfully defend fifth and sixth from a determined Fernando Alonso, Button finishing the better of the pair. Kovalainen took the last point. Unluckiest driver of the day was undoubtedly Force India’s Adrian Sutil, who was on his way to a decent haul of points when his nemesis from Monaco, Kimi Raikkonen, struck. The pair hit each other as Sutil emerged from the pits, wrecking the German’s nose and forcing him to make a second stop to replace it. Stewards announced a post-race investigation, although Raikkonen later retired from the race with engine failure and no penalty was ultimately imposed. Under-fire Sebastien Bourdais was the only other retirement, suffering a hydraulics failure. The result – the first of the season with no Brawn car on the podium – helped both Red Bull drivers overtake Barrichello in the championship standings while the team also closed the gap in the constuctors’ hunt. Button now leads by 21 over Vettel, with Webber a point and a half further back and Barrichello an equal distance behind in fourth. Brawn’s lead in the constructors’ championship is now 19.5 points. He said it had not been possible for him to run competitively: “The start was bad, cars all around me and people outbraking themselves. I got a few places back and got up to fourth with Massa and Kovalainen, but their pace was way off and there was no way through, so it made it a difficult race. Hamilton was encouraged by the success of the upgrades to his McLaren that had suddenly made him competitive again, despite the disappointment from the race itself: “My race was effectively over at turn one. I had quite a good launch down to it and was braking when I felt a tap from the rear and went straight on. I think the flat tyre had damaged the rear floor and it felt like I was out there driving on ice. “I suggested to the team that we save the engine and gearbox for the future because there’s a lot more potential ahead of us than we’d anticipated before this weekend. Categorised under F1, tagged under Formula One, Jenson Button, Lewis Hamilton, Mark Webber, Ross Brawn, Rubens Barrichello.